Over the years, my laundry room has served as my emergency catch-all. You know, someone suddenly drops by and you need a spot to shove things and shut the door. Unfortunately, it doesn't always get cleaned up as often as I'd like (or never, to be honest). I pulled out all of the kids' craft supplies to relocate them in the basement since there isn't much time for crafts these days. Do you think I might have an issue with purchasing and/or holding onto craft supplies? 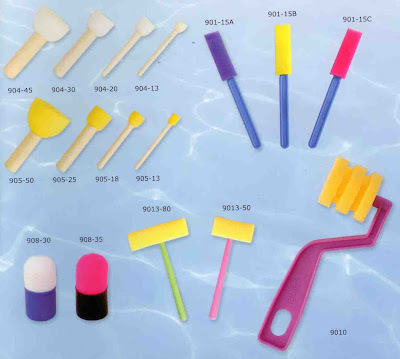 Amid the piles of construction paper, glue, feathers, and play doh, I came across a foam brush set similar to this. I think we all have bits and pieces of a set like this lying around. Something popped into my head about Just a Girl's bathroom bubble-ish looking wall art so I pulled out the paint. I decided I wanted one colorful, kid art friendly zone in my home where we can display some of the cooler projects they bring home from school. I used rubber foot from a shelf to create an open bubble to mix with the solid bubbles for interest. I think you can find them in the aisle with PVC pipe at Lowe's. Try to choose a color theme, mine was blue, then sprinkle in other colors randomly like the red and purple and orange. Overlap some bubbles and make little bubble clusters. This really was fun and a quick coat of paint is all that's required when you get sick of it. So, let's not take decorating so seriously all the time. Do you have a spot where you can just let loose and make it fun? The boys feel like they now have their own kid-friendly art gallery! I write mysteries and make jewelry. My mystery features a Madame President and is available on Amazon. I love that you incorporated a little tree! Very funky and fresh. Adorable! I need all the happy I can get in my laundry room - ha! Love it! Oooooh- this is WONDERFUL! Reorganizing my laundry room (which is in WAY worse shape than yours was- haha!) has been on my to-do list all summer. You've inspired me to finally take the plunge and get it back in order. What a great look!! I'd love to do a painting like that . . . you've started the wheels turning! What a super fun way to paint the walls! I am bookmarking this for future inspiration!! How fun is that laundry room????? You've got my wheels turning, as I imagine this is one room that you really can do anything in. it's adorable! I love it! So cool! I need to do something like that to my laundry room. I LOVE IT! How creative of you! it is super cute, good job! lovelovelove it! so cute! as always, i am super impressed by your talents! Oh wow! I love how you transformed your laundry room into a colorful and happy room. Oh that is super cute:) Great job! How fun! It definitely makes your laundry room more cheerful. I'm here from DIY Day--thanks for sharing! Oh my, I love it. I am going to keep this in mind for my new laundry room. Love it, it's so chearful!! Very cute!! Props to you for being skilled & patient enough to paint the whole room, it looks great! What a cute room! Love the bubbles and the colors. Really, really cute! I have a very boring laundry room, and seeing all of your counter space REALLY makes me want a front-loading washer. I officially have laundry room envy. :) The bubbles are adorable ... thanks for sharing! I love, love, love what you did. I love color and I think that's the perfect spot to do something a little fun. Question, what's the in the little jar. I see the bigger one is detergent...just wondering. I love it!! So cute!!! Its FANTASTIC - Love it!! How fun and whimsical! Love the tree. Thanks for stopping by today! That is just adorable! Great job! For me, I get creative with kid and pet spaces. I designed a playroom just for my dogs (only have one dog now though) and another for the cats, and then there's my son's room and playhouse. I could not love this more! Can I buy you? What a fun project! Why not make this room playful and fun?! What a fun and cute idea that you came up with spur of the moment! I am in awe of others like you that can go off the hip with decorating skills. That is so cute. It looks perfect for a laundry room. Like your kids most colorful clothes just popped and exploded all over the walls. Love it! Love this. What a great idea to inspire you (maybe--hee hee) to do laundry. It looks like a fun room. Thanks for sharing. BTW, found you via A Soft Place to Land DIY day. Cute! It's such a more fun and vibrant spot now and gives purpose to an otherwise overlooked space. Your kids are going to love having a special place to display their works of art! Very cute! What a fun design for your laundry room. It makes it look like such a happy place. Thanks for sharing! Hope it's okay I left the comment here. I just wanted you to know ASAP!